Phil Klingelhofer is the Vice President, Service Committee Chair, and an active member for ARMN. I was lucky enough to interview Phil for this series over a cup of coffee at Northside Social on Wilson Boulevard. I learned that he does a lot more with ARMN than his job on the Board. He has already logged in 1000 volunteer hours since he graduated from the training class in Fall 2014. And he does a lot of Master Naturalist-like activities outside our region. Phil and other volunteers during a stream monitoring event at Bluemont Park on September 28, 2018. Tell us about the ARMN projects you spend time on. I lead the Service Committee for the ARMN Board. I have four talented and dedicated volunteers—Juliet Purll, Joy Tobin, Beth Kiser, and Louis Harrell—who help with a variety of related tasks and issues. We are working to provide ARMN members with a wide variety of service projects that will make a real difference in our community and citizen science opportunities to engage the curiosity we all have in nature. We’re a great team, and we have fun at our meetings. Care to join us? A major priority for the Service Committee is to develop ARMN’s Park Steward program. The aim of this program is to provide ARMN and Tree Steward volunteers with the training, resources, and a collaborative network to take leadership roles and leverage their expertise and knowledge for the protection and enhancement of natural habitat and wild spaces in our local parks. In October, we held our first training session for the program. As part of this stewardship effort, we will also reach out to organizations such as private companies and churches who have groups of volunteers to help with some of our stewardship work. We hope that a number of our volunteer events will be led by an ARMN expert with10-20 participants learning about our natural environment and contributing to our mission. These volunteers should be force multipliers in our invasive work in the parks. 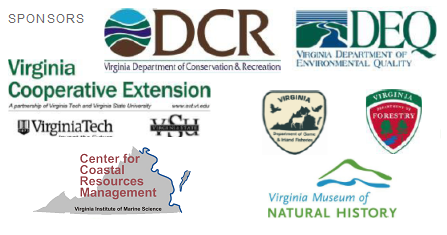 We’re also moving the ARMN Service Committee into an area where we can increase the options for citizen science and do a better job of measuring the impact of our work. My own personal pet project is a habitat restoration effort at Bluemont Park. After I started this effort, Lyndell Core, a fellow ARMN member and county employee, recommended that I apply for Neighborhood Conservation funds from Arlington County for assistance with the invasive removals. Based on the application I wrote and support of my neighborhood, our habitat restoration project was approved two years ago. It includes a five-year invasive plant treatment program by a professional firm, along with other park enhancements. This has already made a huge difference in our restoration effort. I also frequently work at a variety of habitat restoration sites, indulging my passion for removing non-native invasives, making good use of a shovel to install native plants, and leading a regular stream monitoring team for a number of years. I also love serving on the ARMN Board, where I can help plan ARMN’s path forward with other dedicated Board members. In addition, I serve on the Arlington Urban Forestry Commission and Neighborhood Conservation Advisory Committee, where I try to give a voice to nature in our community. Personally, and outside ARMN, I just returned from a week of birding on the North Carolina Outer Banks at the Wings Over Water Birding Festival. It’s the third year that I have attended this event, and I participated with small teams on two “Big Days.” My teams set records of 122 bird species, then 125 species, on consecutive days. O.K., I am a bit of a bird nerd…. The highlights of the trip included watching Northern Harriers sweep the fields for dinner, while black bears ate below and the snow geese and white pelicans swooped in for landing on the water impoundments. Phil at the Bodie Island Lighthouse, Nags Head, North Carolina on October 17, 2018. What brought you to ARMN? I heard about ARMN from my sister-in-law who lives in Rockbridge County and is a Master Naturalist there. I was intrigued with the program because I’ve always loved nature and science. So, I started paying attention to ARMN from afar while I was still working, and as soon as I retired, I seized the opportunity to take the training. What do you like most about ARMN and what has surprised you most? I like hanging out with people who like nature and put their backs behind their mouths. People in ARMN like talking about nature and being out in it. But more than talk, they are willing to work and make a difference in terms of improving our natural environment through physical labor and sharing their love of nature with others. I have been surprised by how many ARMN members are serious experts about a wildly diverse set of scientific issues. Tell us something about your childhood experiences that shaped your perspective on nature. I fell in love with birding when I was about five years old. My older brother built a bird blind in our backyard with a drip buck over a small pond. I would lie on my back for hours watching the birds take advantage of the habitat my brother had created and use my Field Guide to the Birds, (Peterson, 1947, 2nd edition) to identify them. I started out as a physics major in college because I wanted to be an astronomer. When the math became more intense than I anticipated, I switched to become a psychology major. I worked in the banking industry and then ran the operations for a national trade association in the energy field, but I’ve always loved science and nature. What are some other interesting or unusual things about yourself fellow ARMN members and others might want to know? I was once fluent in German and French. As an elementary student, I attended the German School (run by the German Embassy in Washington) for nearly four years, taking classes and exams 100% in German. My father was born in Germany and came to the US just before World War II. Later, to confuse things, I studied French for six years in high school and college. And while my German and French are still pretty good, I’m no longer fluent. I like to think I only need to take a few trips to Europe to bring it all back. This entry was posted in News, Service Projects, Stewardship by ARMNed. Bookmark the permalink.